World of Warcraft writers have received harassment and reported death threats in the wake of the game’s latest cinematic. A new Warbringers video finally shows the long-awaited Burning of Teldrassil, and some members of the community don’t like the direction the game seems to be taking. This article contains spoilers for the Battle for Azeroth cinematic, so read on at your own risk. The video focuses on Sylvanas Windrunner, the current Warchief of the Horde. After a battle on the shores surrounding the enormous World Tree Teldrassil, home of the Night Elves, Sylvanas comes across a wounded soldier. A flashback follows their brief conversation, documenting Sylvanas’ death and subsequent transformation into a Banshee at the hands of Arthas. As the flashback ends, the wounded Night Elf tells Sylvanas that whatever she might do, she can’t destroy the Alliance’s sense of hope. 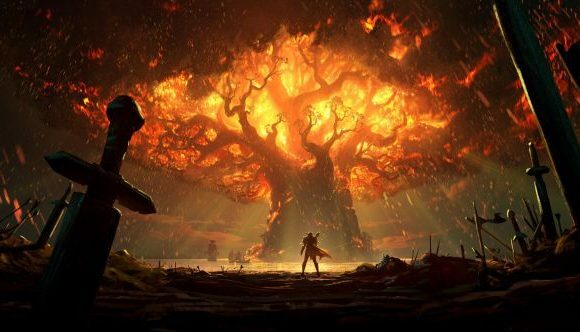 In response to that, it’s finally revealed that Sylvanas is responsible for the Burning of Teldrassil, essentially committing genocide against the Night Elves, killing countless innocents as the World Tree burns. Players’ anger at the reveal stems from many places, but a key aspect of it is reminiscent of what we saw during Mists of Pandaria. In that expansion, Horde players were very much the Bad Guys – the final boss was the Horde’s Warchief, and not everyone wanted to be told that their character was evil. Sylvanas’ outburst at Teldrassil seems to point Battle for Azeroth in a similar direction. Even if that turns out not to be the case, Horde players now officially have a genocide to their names. Other frustrations suggest Blizzard’s writing is lazy or predictable, as players have been wondering who would be responsible for the burning of the tree for months, and many were hoping for a more surprising revelation. Some members of the community have reacted poorly, having attacked writer Christie Golden on Twitter. The Warbringer shorts had all been planned out before Golden came on board, but she happens to be the most public-facing member of the writing team. In response, multiple threads have appeared on the World of Warcraft subreddit, including one front page post asking players to stop harassing developers. The post names Golden in particular, and some comments allege that the writer has received death threats in response to the video. The Battle for Azeroth release date is August 14. If you want to see the Burning of Teldrassil for yourself, you can check out Sylvanas: Warbringer in the video above.